The following is a review of High School Essay Intensive from Institute for Excellence in Writing with the TOS Homeschool Review Crew. Both of my daughters' high school classes have repeatedly been enhanced by lessons learned from IEW. Andrew Pudewa's voice has become a familiar one in our home through his DVD lessons. Strategies for the "personal essay"
As my daughter registered for the ACT without essay writing and is not taking the SAT at this time, those two options were not our primary focus. Instead, she concentrated on the general strategies and personal essay portions to sharpen her essay writing skills. However I will have her return to the other two sections to glean highlights from their test-taking tips. I briefly reviewed the ACT prep section and loved the components teaching students how to analyze different perspectives and then to compare and contrast their own perspective with the others. That is an important life skill! 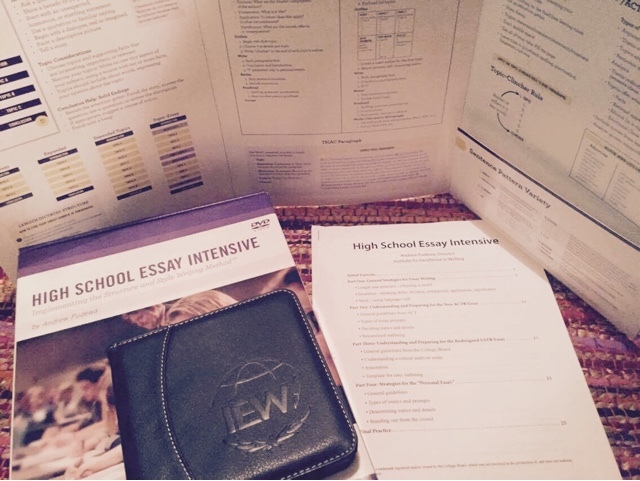 Our review box included IEW's Portable Walls for the Essayist which is a tri-fold folder of cardstock printed on every side with helpful tools for essay writing. My son has benefited from their original portable wall which has helped him to block out distractions and concentrate. This is just like that but with new content. The five DVDs are each in sleeves in a nice leather like case, and set of 26 printed pages of notes to accompany the DVD lessons. Additional handouts (or download link) can be purchased for use with multiple students. Practice and homework are built into the lessons. Although these are recorded from a live one day class and could theoretically be completed at home in one day, my daughter broke it down into more manageable two to three hour segments each time. 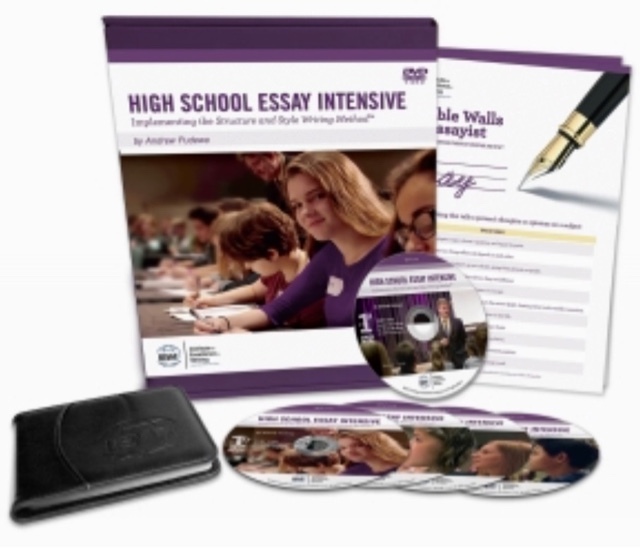 My daughter shared: "The IEW High School Essay Intensive teaches students important lessons about writing essays. Included with the DVD lessons is a portable wall which has important tips that you learn from the lessons printed on it. From the very beginning of the lessons you jump right in and learn that writing essays is not always easy. The lessons are engaging and easy to follow. One of the things that I learned with the course is how to properly structure your essays so that all of the paragraphs fit together. Also, included is a handout booklet which allows you to answer questions discussed during the lessons. This helps a lot as it keeps you listening and paying attention so that you don't miss anything. In some of the lessons it discusses how to prepare for the ACT and SAT essays. Overall it's an extremely helpful course if you want to improve your essay writing skills." So the very simplified version of how it works for us... pop in the DVD, listen, press pause, write, repeat last three steps, discuss with mom. Of course the actual process is lengthy, but the instructions are clear and easy to follow. The handouts make the lessons even easier to follow as key points are printed (including word lists on the original portable wall) and spaces are numbered for notes. Official guidelines are included from both the ACT and the College Board. Analyzation, evaluation, and logical reasoning skills are built into the course. Did you know that the five paragraph essay is not always the ideal model? In fact, some college instructors even deduct points if students use them! These lessons show alternatives and teach students how to make their essays stand out. Expository, descriptive, argumentative, persuasive, analytical, narrative, and personal essays are all discussed. I'll plan to use this with my son, too, when he is in high school.